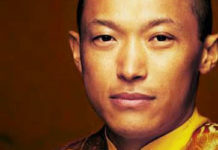 Born in Bodhgaya, India, in 1962, the Sakyong is the eldest son of Chögyam Trungpa Rinpoche and Lady Könchok Palden. 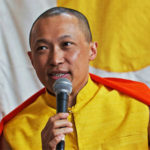 He is the incarnation of Mipham the Great, a renowned Nyingma scholar and meditation master. As part of the Mukpo clan of eastern Tibet, he is a descendant of the Tibetan warrior-king Gesar of Ling. It is you, supreme among gods and humans, Who coalesced the 84,000 dharmas Into a single, indestructible life force.